Honda Malaysia announced that the New HR-V is available now for Malaysians to place a booking beginning 12 July 2018 at all 95 Honda authorized dealers nationwide. The Company also announced a new RS variant for its segment-leading compact SUV, the HR-V. The compact SUV, HR-V was first introduced in 2015. Since its introduction, this Honda model has received overwhelming interest and response from customers. This Honda model retains its No. 1 position for three consecutive years in the compact SUV segment and has sold more than 72,000 units as at June 2018. The HR-V is also Honda’s current second best-selling model, contributing 16% of overall sales as at June 2018. The New HR-V has also added a new variant into its family – the RS variant which exudes a bold and powerful expression made possible by the overall exterior design. The RS variant appears sportier and attractive with an exciting new exterior featuring, Honda’s Signature design, the ‘Solid Wing Face’ concept and sporting a new set of headlights including the newly designed LED Headlights with LED Daytime Running Lights (DRL), LED fog lights and Rear Combi LED guide lights. Dual-Tone Alloy Wheels, Sport Design Front Grille, New Front and Rear Bumper. New detailing such as a dark chrome outer handle, black chrome license garnish, sport black side sill and even mesh fog garnish provides a fresh and vibrant feel to the RS variant. 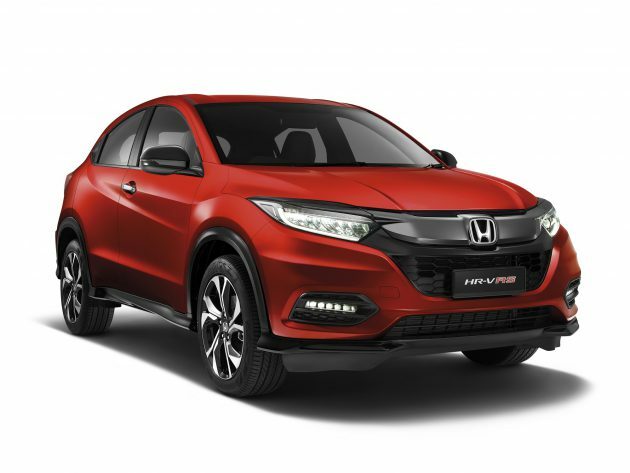 Honda Malaysia has introduced a new colour for the New HR-V, the Passion Red Pearl, which is the first in Honda Malaysia’s colour line-up. The New HR-V maintains the effortless Multi-Utility Cargo Space by keeping maximum space utilization in mind. The large trunk space can be adjusted through versatile rear seat configuration modes known as the Utility Mode, Tall Mode and Long Mode. These modes allow the New HR-V users to obtain their desired space for their daily and long distance travel usage. Safety will always be Honda’s top priority. To further enhance safety in New HR-V, the RS variant is fitted with the Honda LaneWatch, a camera system mounted on the passenger side mirror. The passenger side view of the adjacent lanes next to the vehicle including blind spots will be displayed on a display system in the car. This allows a better viewpoint and provides safer driving condition for the driver. The HR-V is loved by Malaysians for its spaciousness, user-friendliness, practicality and functionality in its features, offering total comfort for passengers while bringing the Joy of Driving to the drivers. Honda customers can now enjoy more value-added features with this New HR-V, appealing to customers with a desire for space during travels, providing convenience and practicality for everyone in the family. The New HR-V is targeted to be launched in Q3 of 2018. To appreciate Malaysian customers for their continuous support, Honda Malaysia will be rewarding all customers who place a booking for the New HR-V with a Petronas Gift Card worth RM1,000.